Due Process & Equal Protection in Millard County — a Case Study | RANGEfire! For most people, it seems, the concepts and principles of “Equal Protection” and “Due Process” seem somewhat hazy. What do they even mean? Most of the time stories of unlawful unequal treatment have to do with discrimination based on race, gender, religion, and usually happen somewhere else, far away — because that sort of thing never happens around here, right? Under equal protection laws, it is unlawful for anyone to discriminate or treat others differently based on protected classifications, including race, religion, gender, age, etc. But when it comes to government — at any level — it is unlawful for government actors to discriminate and treat people differently regardless of the classification. 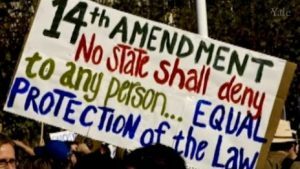 The Fourteenth Amendment to the U.S. Constitution mandates equal treatment. Under the Utah State Constitution, all laws and governmental processes in the state of Utah are supposed to be applied uniformly and equally to everyone. In a nutshell it really boils down to fundamental fairness, and the Golden Rule — do unto others as you would have them do unto you. So with that in mind, let’s consider, compare and contrast the recent handling of land-use decisions by.Millard County Officials. In 2016/17 the David & Julie Johnson Family applied to build an industrial pig farm four miles south of Deseret. In 2017/18 Jason & Jennifer Christensen (J&J Hogs) applied to do the same thing approximately two miles north of Flowell. This is an interesting story. I have written extensively about part of this before (See The Current Status of Property Rights in Millard County), but in summary, Smithfield Foods, a division of Murphy Brown, LLC., has recently been seeking to expand its industrial hog finishing operations into Millard County from adjoining Beaver County, where it and its predecessors have been operating as Circle 4 Farms, for about 20 years. As part of that expansion, in late 2016 Smithfield sought a zone change to secure a conditional use permit to construct 16 new grow-out barns on the Millard County side of property Smithfield owns that straddles the Millard/Beaver County line. This is a very remote area, 15-20 miles north of Milford, approximately 50 miles south of Deseret. As part of its proposed expansion, Smithfield has also been looking for contract growers in Millard County, so the David & Julie Johnson family viewed this as a good opportunity to create additional, productive, incoming-producing opportunities for their family. According to the available information, the Johnson Family proposed to construct four (4) grow-out barns capable of producing almost 5,000 finished hogs/year per barn. Just to be clear, this would be what is often referred to as a “Factory Farm.” They were planning to do this on approximately 220 acres four (4) miles south of Deseret. This would allow them to put otherwise essentially useless/worthless brush ground that has good access to essential infrastructure, to productive, beneficial use. So in late 2016 Johnsons likewise applied for a zone change from AG20 to AG Industrial, in order to secure a conditional use permit to construct the barns. The Millard County Planning Commission held a public hearing regarding the zone change applications. As is often the case, apparently not many people were paying attention, and few showed up at the public hearing. The planning commission considered the substantive merits of the applications and determined that they met the requirements for a zone change under the Millard County Land-use Ordinance, and voted to recommend the proposed zone changes to the Millard County Commission for approval. Construction of the barns would still require conditional use permits. Following the public hearing before the planning commission, however, apparently more people became aware of the proposed projects, and things really started heating up in terms of public opposition. Consequently, in addition to another, required public hearing before the Millard County Commission on Thursday, January 26, 2017, the Millard County Commission went the extra mile and went out of its way to advertise and hold multiple additional informational meetings to provide the public in that area an opportunity to learn more about the project, prior to the public hearing. As is also often the case, apparently word about the proposed projects spread, because the informational meetings were well-attended. 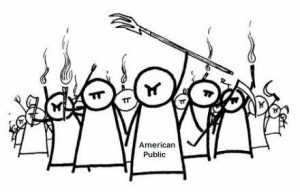 In addition to just asking questions and trying to learn more about the project(s), however, some members of the public began to voice active opposition, and sought to lead an opposition movement. Because there had been essentially no public opposition at the planning commission hearing, the growing opposition seemed to catch the Johnson family somewhat by surprise. As the meetings continued, attendance numbers grew, and the opposition grew more vocal. 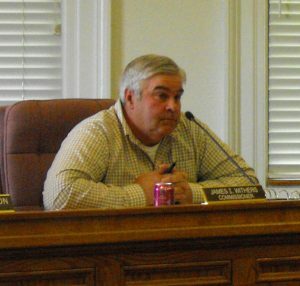 Based on the growing public clamor and vocal opposition that the Millard County Commission had effectively stirred up through its public information campaign, following the second informational meeting, the Johnson Family threw in the towel and withdrew their zone change application even prior to the second public hearing before the Millard County Commission. But the approval process went forward for Smithfield’s property on the Millard/Beaver County line. When it came time to vote on the Smithfield zone change, Commissioner Jackson noted that when he was campaigning for election in 2016, the biggest message he heard repeatedly from Millard County residents was that they didn’t want to continue to lose their property rights, and the right to use their property. He said that he didn’t realize what would happen to test those issues and principles so soon after taking office. Commissioner Draper voted against the zone change on the Millard/Beaver County line based on his expressed concerns about risks to groundwater quality in that area, where the closest residential neighbor, with a culinary groundwater source — the Kauffman Ranch — was seven miles away. Now, let’s consider the County’s handling a year later of a similar approval process for Jason & Jennifer Christensen (J&J Hogs) to do essentially exactly the same thing two miles north of Flowell. 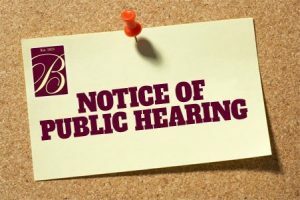 Just as with Johnsons/Smithfield, in late 2017 the Millard County Planning Commission went through the motions of conducting a public hearing regarding the J&J Hogs proposal. Once again, not surprisingly, no one showed up. Although there are multiple residential neighbors with culinary wells within 1-2 miles of the proposed J&J hog farm, and Fillmore City has one or more municipal wells in the same aquifer, in terms of due process requirements, it is unclear whether the county undertook any effort to notify them about the public hearing(s). Although the U.S. Supreme Court has held that the due process provisions of the U.S. Constitution require that “before the State conducts any proceeding that will affect the legally protected interests of any party, the State must provide notice to that party by a means certain to ensure actual notice as long as the party’s identity and location are ‘reasonably ascertainable’.” Mennonite Board of Missions v. Adams, 462 U.S. 791, 800(1983), Millard County routinely ignores that requirement, and insists instead that constructive, public notice postings are sufficient. SEE Due Process — the Golden Rule of Principled Government. Fuzzy, vague laws violate the due process guarantees of the U.S. Constitution. Vague laws beget two evils that are related: They do not give citizens reasonably clear notice of what behavior is proscribed or prescribed. And they give — actually, require of — other officials excessive discretion in improvising a fuzzy law’s meaning. According to Justice Gorsuch, Vague laws “invite the exercise of arbitrary power” by “leaving the people in the dark about what the law demands and allowing governmental officials to simply ‘make it up’.” The lack of “precise and sufficient certainty” (criteria stipulated by the English jurist William Blackstone, whose writings influenced the Constitution’s framers) invites “more unpredictability and arbitrariness” than is constitutional. Furthermore, the crux of America’s constitutional architecture, the separation of powers, is implicated. All legislative power is vested in Congress. The judicial power, Gorsuch wrote, “does not license judges to craft new laws” but only to discern and follow an existing law’s prescribed course. So, allowing vague laws would allow the legislative branch “to hand off the job of lawmaking.” Hence such laws not only illegitimately transfer power to other administrative officials, leaving interpretation and enforcement to a matter of hunch. See Gorsuch Delivers the Hammer. But in any event, without any opposition, the planning commission made a positive recommendation to the county commission. Instead of conducting any kind of public information campaign before conducting a public hearing, however, the county commission quickly conducted a public hearing, apparently without giving any actual notice to any affected parties, and once again, no one showed up to say anything. So the county commission expeditiously voted to approve the zone change. At that point, with no public awareness whatsoever, the approval process was flying deftly under the radar. After the zone change was completed, J&J applied for a conditional use permit, and the Planning Commission conducted another public hearing. Although, once again, it is questionable whether there was any required actual notice to interested parties as required under applicable law, this time a couple neighbors — Matt Kesler and Demar Iverson, did show up to ask questions and express concerns. The planning commission tabled further consideration of the application, pending receipt of additional information. Then things really got interesting. By then it was mid-January, 2018, and the Millard County Commission was looking to appoint two new members to the planning commission. Interestingly, based on Commissioner Draper’s recommendation, the commissioners moved to appoint both Kesler and Iverson (who only live about 3 miles apart, in the Pahvant area, near the proposed J&J pig farm) to the planning commission. When the MIllard County Planning Commission next met to again consider the J&J conditional use permit application, Kesler and Iverson were on the board. But Commissioner Draper suggested that based on their previous opposition to the proposal, they should abstain from the vote. When Greg Greathouse and Molly Stevens likewise abstained, there was no quorum to vote on that issue. Because the planning commission was still waiting on additional information from J&J, including an odor mitigation plan, it again attempted to table the application with no recommendation for or against, before ultimately voting (without a quorum?) to forward the application to the county commission without any recommendation. And that raises an interesting question: if four planning commissioners all announced that they were going to abstain from discussion and voting on the J&J issue, which created a lack of quorum, how could those same commissioners then turn around and make motions, second and vote on the same issue? And what were the deputy county attorney and county commissioner who were in attendance at the meeting thinking? Among other things, Utah Code Section 17-27a-502 expressly provides that the county legislative body (the county commission) cannot undertake any land-use regulation without a recommendation from the planning commission. According to the minutes from the February 6th Millard County Commission Meeting, however, Commissioner Withers was quite irritated that the J&J application wasn’t on the County Commission agenda, and demanded to know why. Commissioner Draper and County Land-use Administrator Adam Richins explained that it was because the planning commission had taken no action, and would possibly be reconsidering the issue again at its next meeting. Rather than waiting for the next planning commission meeting and a recommendation from the planning commission, Commissioner Withers insisted on moving forward and voting on the application on February 20th, in direct violation of the express provisions and requirements of applicable law, including Utah Code Section 17-27a-502, despite the fact that there was no recommendation from the planning commission, based on incomplete information, and the item hadn’t been included on the posted County Commission meeting agenda, let alone any actual notice to affected parties. And, once again, interested parties, including neighbors, had not been given any notice, actual or otherwise, of what was going on. Colleen Halsey, and Roxanne Layton, some of the closest neighbors, said they had never received any notices from Millard County. And Demar Iverson, another neighbor, said that the day before the meeting he called Commissioner Draper to find out what was going on. Draper expressly told him it wasn’t on the agenda and assured him that it would not be discussed. After now having a chance to review the meeting minutes, and according to sources present at the meeting, it is clear that the J&J pig farm conditional use permit application did end up being discussed — at some length — after which Commissioner Withers moved to approve the application without first allowing any further public input. Although Commissioner Draper later claimed to have been blindsided and ambushed, he seconded the motion anyway, without stating any objections or reservations, and all three commissioners voted to approve it. And just like that, in contrast to the Johnson Family application process, notwithstanding Equal Protection, Due Process, and Open & Public Meetings laws to the contrary, the J&J approval process was over. Bringing the discussion full circle, these are the fundamental questions: Was this equal protection and uniform operation and application of the law and applicable approval processes? Were all the affected parties with protected property interests at issue in these two situations given fair and equal treatment? Were they given actual notice and a reasonable opportunity to be heard? If not, why not? And perhaps more importantly, does it matter? At no time have I received any notification in any form regarding ANYTHING pertaining to the proposed pig farm. I would have attended the meetings, as I am going to attend the meeting on the 20th of this month to voice my concerns. I am appalled at the lack of regard to the residents who are located near the proposed site, as well as the disregard of the legal due process! I have quietly followed your postings for some time. Because I agree with about 95 percent of the things you’ve written, I would like to state I mean no disrespect here. I don’t believe there to be a lack of due process in the case of our zone change, and CUP. When we went to the Planning and Zoning commission with our CUP application (the first time it was tabled), the discussion came up in that meeting that people felt this was being done in secret. One of the P&Z commissioners spoke of what we may be able to do to make residents more informed. There were suggestions of flyers, door to door campaigns… My question in all this is where does the counties/my responsibility to inform people end? What does the county ordinance say? Who are the “affected entities”? Which residents are due a personal notice? Fillmore? Kanosh? At what point are people responsible to watch the public notices to know what is going on around them? I can’t say I agree with the way things were handled in the Johnson family instance last year. Maybe things could have been handled better in both, or all three cases. I can say that I have learned a lot in this process, about the process, and especially human nature. I believe our county government are just like most of the rest of us: I believe them to be honorable people who do the best they can with the information they have. Jennifer and I never had any intention of trying to push this through in secret. We have both been very open throughout the process. We believed that the word had gotten around by word of mouth. We had ask us about it in public all the time. Maybe that was a mistake made on our part. Much like what was said about the Johnsons, we saw this as an opportunity to make something better for our family. Since then we have done our best to comply with all the requirements asked of us to reach this goal. We will continue to do so in the future. We always welcome comments and concerns and have done our best to a dress as many as possible. Jason, thanks for chiming in. There is nothing disrespectful about what you’ve said. From my perspective, no one is questioning what you did or how you went about it. You’re business people legitimately seeking approval. And as a private sector enterprise, you are fully entitled to keep your business dealings entirely to yourselves. You have no Due Process obligations. It is the “the State” — the applicable governmental entities — that are legally and constitutionally obligated to operate openly and transparently in ensuring legally and constitutionally sufficient Due Process, Equal Protection, and uniform application of applicable laws and processes. The county can’t meet any of it’s legal and constitutional requirements through you. It’s their obligation. The constitutional requirement of actual notice to parties with protected property interests is the County’s obligation. Assumptions about word getting around by word of mouth will never cut it at any meaningful level, in terms of satisfaction of the County’s legal and constitutional obligations. That is not what the law requires. It sounds like you’re also making plenty of assumptions about so-called honorable actions and intentions. The problem with that is they should know better. There is much more to that equation than meets the eye — that you are apparently unaware of. This has been an issue for quite some time, and has been litigated multiple times, with Millard County repeatedly claiming ignorance. But at this point there have been too many cases and situations for them to be ignorant. 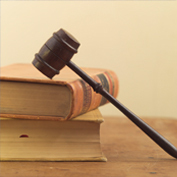 As a matter of principle, they are required to make a good faith effort to follow applicable laws. There is a long-standing habit pattern of Millard County expecting everyone else to follow the law, while ignoring the laws that govern their own actions. Rather than ignorance or honorable intentions, the principle that does seem to apply here is “Deliberate Indifference.” Millard County leaders have repeatedly demonstrated that they are deliberately indifferent to applicable legal requirements. And because they are so seldom called on it, and their feet are so seldom held to the fire, they keep thinking they can get away with it. As a matter of principle (versus personality), in the United States of America, there is nothing honorable about deliberately treating people differently just because of their last name, who they know, or which side of the tracks they live on. There is also a big issue with Millard County’s monstrosity of a land-use ordinance, which makes life tough for everyone involved, including both those trying to get something done, and those trying to make sure that their pre-existing uses and property interests are not unreasonably interfered with. 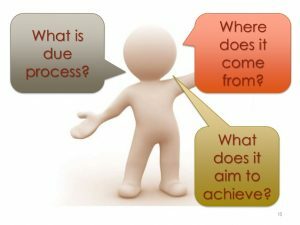 Due process is supposed mean something — that everyone with a protected interest has fair and reasonable notice, and a reasonable opportunity to have their “due” by having a meaningful opportunity to be heard — after receiving fair and reasonable notice, before a decision is made. That is what due process means. But it cannot happen unless affected parties receive actual notice. I apologize for getting off in the weeds with what i have done to notify people. I understand that I have no obligation to notify. My point about the process that was followed during our application and approval is maybe more to what you said about our land use ordinance. significant modification because of an intended use of land; (b) the entity has filed with the county a copy of the entity’s general or long-range plan; or (c) the entity’s boundaries or facilities are within one mile of land which is the subject of a general plan amendment or land use County’s Land Use Ordinances change. I am asking for clarification on who should have been informed. Very legitimate questions. The Millard County land-use ordinance is a vague and ambiguous mess, and I pity anyone — including you guys — who has to attempt to navigate it. 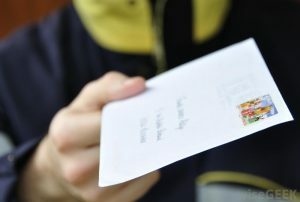 But with respect to your question: According to the U.S. Supreme Court, “before [any state or local governmental entity] conducts any proceeding that will affect the legally protected interests of any party (a neighbor who’s property rights/interests might be affected, for example), the State must provide notice to that party by a means certain to ensure actual notice as long as the party’s identity and location are ‘reasonably ascertainable’.” Mennonite Board of Missions v. Adams, 462 U.S. 791, 800(1983). Unfortunately, Millard County has a long-established habit pattern of ignoring that requirement. We can look to the Smithfield case on the Millard/Beaver County line for a good example of what we’re talking about. In that case, while all the people from Delta and Deseret — at least 50 miles away — were certainly entitled to say their piece and express their opinions, and should be commended for getting involved and doing so, they had no protected property interests that were directly at stake in the discussion, whereas Kauffmans, seven miles away, certainly did. There is a huge piece of the story missing here. It was the choice of P&Z to send this to the commissioners with no recommendation. It wasn’t that they were blocked from the chance of another meeting. The motion was made and passed to send it through without. If there was no quorum on that issue, how could they make or pass any motion on that issue? Let’s look at the minutes and see what they say. And, how does that change the Due Process, Actual Notice, and Equal Protection equation, which is the real issue? You’re right. According to the minutes, there is more to the story. involved in the meeting last month they would both like to abstain from voting. Commissioner Greg Greathouse made a MOTION to table for one more month. Commissioner Greg Greathouse withdrew his motion. Motion. Voting was unanimous in the affirmative. So one of the questions is, if Greathouse and Stevens abstained, creating a lack of quorum regarding this issue, how could they then make any legitimate motion(s) or second on the same issue that they were supposedly abstaining from, resulting in no quorum to take any legitimate action on that issue? Who was advising the commission that this was legal or acceptable? But even more importantly — especially in light of what happened afterward, is the fact that under explicit applicable law — Utah Code Section 17-27a-502 — which is something that everyone else (including the county commission, county attorney, etc.) has completely ignored — it would not even be legal, under applicable law, for the county commission to take action on a land use regulation without a recommendation from the Planning Commission. Commissioner Withers questioned why something was not on the agenda to discuss the J&J Swine pig farm. Mr. Richins said that there was not a quorum at the last Planning and Zoning meeting; unless it can be forwarded to the Commission without a recommendation, it would be heard at the next Planning and Zoning meeting and presented to the Commission thereafter. Then, according to the minutes from the February 20, 2018 Millard County Commission Meeting, the county commission went ahead, without any actual and appropriate notice to affected parties, in violation of applicable constitutional law, and without any recommendation from the Planning Commission, in direct violation of Utah Code 17-27a-502, and as is all too often the case in Millard County government, they completely ignored applicable law, and went ahead and passed the conditional use permit anyway. Again, you’re right, there is more to the story — the substantive legal, procedural, and due process issues are probably much more serious than previously thought. Todd…. thank you for the clarification. This is the only information that I’ve seen that actually puts the pieces together. I feel bad for the Christensens, or anyone else for that matter, trying to put together a business in this potentially, awesome county. When there is this apparent level of incompetence among our governing bodies, most people understandably, just throw up their hands and go someplace else. Where was the legal counsel for our commissioners? Who counsels the the P and Z folks?